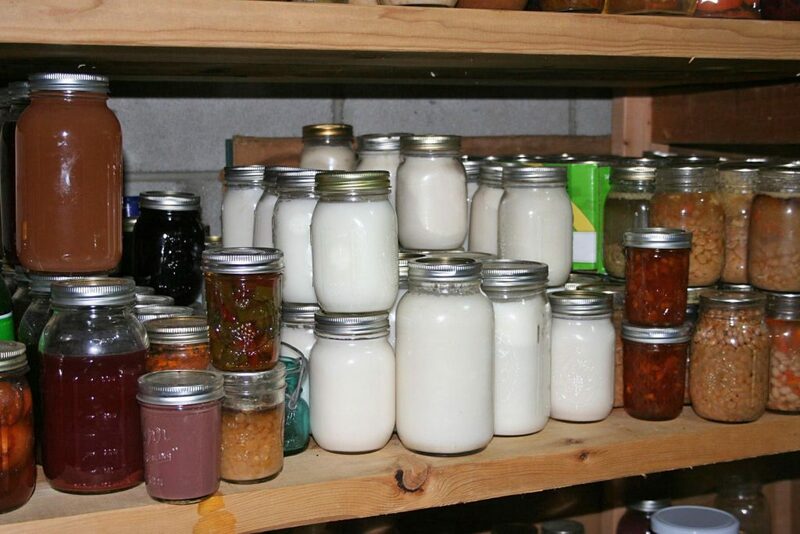 I’m so happy to have lots of pure white canned lard on our pantry shelf. Yesterday was a good day to stay inside as we had freezing rain/frost. It was a little tricky walking around in the driveway, but then it turned to sleet and snow and that roughed everything up so it’s much better today. It was sure pretty on the trees. Looked like a Christmas card outside. 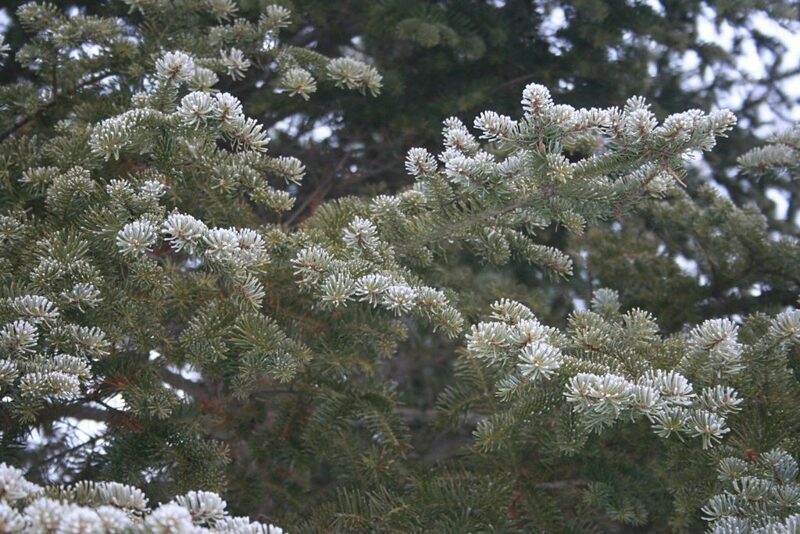 See how pretty our trees were with their ice/frost coating? A friend gave me two cases of #10 cans of refried beans she’d been given. They kept a case but she didn’t know you can actually re-can them so I told her my method and she’s going to do hers up too. Tomorrow I’ll be starting in on mine. Yes, experts tell us we can’t can refried beans. And I agree because they’re so thick the heat may not reach the center of the beans in the jars during processing. But what I do is put them into my handy-dandy turkey roasting pan, add enough hot water to make them the consistency of, say, chili or baked beans to can, mash them up, mixing with the water, then heating the roasting pan contents to boiling in the oven, set at 300 degrees. Then I quickly scoop them out and pack into hot jars, leaving an inch of headspace. Remember, they’re a little “watery” but that’s okay; when you open a jar and heat them up, the juice quickly evaporates. And the taste is fine. I process these beans at the same pressure and time you do baked beans; 75 minutes for pints and 90 minutes for quarts at 10 pounds pressure. This makes a lot of meals for pennies! They’re great in tacos, enchiladas, or as a side dish. Wish you could sell that lard by the jar. It looks so good. It IS, Zelda! There’s such a big difference in the taste of foods fried in lard rather than shortening or corn oil! And the baked goods….ah! Wow those are some cold temperatures! We’re finally getting a blast of snow today, Saturday, here in Michigan. The lard jars are gorgeous! So envious… Thanks for the info on the refried beans. Good to know. We’ve got a bit of warmth today but sub zeros are on the way again. Boo hoo! Speaking of Chili…here’s a tip. You can stretch Chili to make more and give a more meat substance texture by adding cooked wheat berries to the mix. If I am cooking the beans from scratch, I just add the wheat in the last part of the cooking the beans. When making quick cooking chili using canned beans, I cook it separately and add it to the Chili pot. Makes sense, Donna. I also sometimes add sweet corn to my chili. It makes it go further and also changes the taste just a bit. Pretty good! Is this what you used before the solar panels? Well, let me think. No. At first we just used the generator to power the house. Then when we got our first small panels and wind charger we added the first four batteries. Since then we’ve added many more volts of power via new solar panels and improved our storage of that power with more batteries; now we have 8 6 volt golf car batteries. Good to know about the refried beans. Homesteading is such a great life, isn’t it?! Stay warm! Yes it is! I’d hate to even think about living any other way! LOL – And I was complaining because it was 34 and breezy here today! Now that was ABOVE zero??? Heck, we’d be running around in T shirts at 34! Big smile! Was thrilled to get this info. We live in Mormon Country (they store food) and every once in awhile we have found #10 cans at a dump site. Which my son goes to often with his construction business. Now if he finds refried beans I will know what to do. Just FYI, you can also re-can most everything you can find in #10 cans! When we lived in Montana, there was a scratch n’ dent store where I could buy such foods as peaches, tomato sauce, refried beans, hominy, etc. in #10 cans, for a dollar or two. I re-canned those up nicely. What a good deal! My hubby passed away 4 weeks ago tonight, but I just want to mention, Jackie, we had many pleasurable years of reading your articles and helpful hints on homesteading! Oh Ginger, I’m so sorry! You know I’ve been there, where you are and feel the pain you are going through. Remember, he’s still there, in spirit, homesteading with you. Hang in there girl. My prayers are with you. I’ll make another suggestion for using them. You might try adding them to chili. I tried and enjoyed a recipe for quick chili that used refried beans to thicken it and improve the flavor without extended cooking. Alice, I like to do that, too. Helps thicken the chili!